A never-before-seen interview with the late Steve Jobs is debuting Wednesday night in a handful of U.S. theaters. The guy who conducted the interview, technology writer Robert Cringely, teamed up with Landmark Theaters owner Mark Cuban, to show the one hour and nine minute interview that was filmed in 1995 for a television series and then was lost during shipment. Only recently was it discovered in the director’s garage, says Cringely, and now joins the official Jobs biography, and a handful of television mini-documentaries that popped up right after his death, in feeding the seemingly insatiable appetite for Jobs-related media memorabilia. I saw an advanced copy and overall found it fascinating. In the beginning, there’s a lot of what you would expect: Jobs with his Lennon glasses and signature black turtleneck, the stories of his youthful obsession with electronics, the creation of Apple (s aapl) with co-founder Steve Wozniak and the blue boxes they built before that: in other words, the standard Apple and Jobs trivia, but this time repeated by Jobs himself. At least for the first part of the interview, those who have read the recent Walter Isaacson-penned biography will recognize much of the content. But what’s most striking about the interview is its place in time. 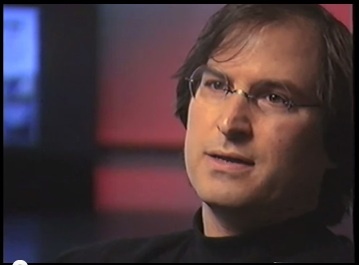 The interview was taped in 1995, a year before Apple bought NeXT and Jobs returned to the company he founded. This interview stands as a historical snapshot of Jobs between the two defining periods of his life at Apple: after his incredible rise to the pinnacle of the computing world and eventual exit from the company, but before he returned for the greatest second act in the history of business. Also interesting is his demeanor. It’s not like his tone in his biography, where he knows he’s terminally ill and he’s accomplished even more than he ever thought he would. This is Jobs in the prime of his life, only a few years married, and so obviously the underdog in Silicon Valley. He comes across as thoughtful, somewhat amiable, frank, mature and most of all, seems chastened by his downfall at Apple. The scars are still clearly there, but not quite at the surface as you might expect for an incredibly emotion-driven man. There’s also some great stuff on Jobs’ own ideas and vision of how to build great products and companies, his management principles, his theory on building the best possible team, design, and his thoughts on Microsoft (s msft) (naturally). It’s shorter than typical movie length, and it’s not a documentary. It’s essentially just a rough cut of an interview, with a little bit of context and almost no analysis added. But it allows you to make your own judgments about the man and where he, and especially Apple, were at that point in time, and reflect on where they both have come since. For a list of theater showings Wednesday and Thursday, check here. Thanks for the post, cant wait to see this, it should be great, anything to do with Steve Jobs has gold all over it! Rest in peace steve! The Jobs interregnum interview: in theaters tonight http://t.co/kpnOYgnT Jobs is my hero always. I just don’t like tech illiterate IOS fans.